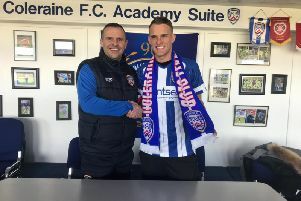 Dean Shiels' career has gone full circle after he put pen-to-paper on an 18-month deal with Coleraine. The Showgrounds was like a second home for a young 'Dixie' during his father Kenny's tenure with the Bannsiders. He loved nothing more than getting on to the pitch before and after games, firing shots into the Railway End goal. "Those were great days. I remember getting thrown off the pitch all the time," said Shiels. "As I got older I got to warm up Davy O'Hare. "I've still got really strong memories of those days, hopefully I can create some memories now as a player. A young Dean Shiels pictured with the Coleraine side who won the First Division in 1995/96. "I've grown up following the club with my Granda being a big Coleraine fan, then obviously my dad and my uncle Sam. "I always wanted to play for Coleraine when I was young, it's all I ever wanted to do. I'm delighted I can make that happen now." Shiels family connections don't just stop there, his brother-in-law, Oran Kearney, managed the club to Irish Cup success last year. The 33-year-old says but Kearney and his dad were delighted to see him join the club. Dean pictured at The Showgrounds before a Coleraine game in the 90s. "I spoke to my dad and Oran a lot in the past couple of weeks and they both were very keen for this to happen," he said. "They knew I was keen to come here and they had nothing but good things to say about the club. "They didn't need to talk up the club to me, I know the club well, they just told me to go and sign." Shiels is hoping to be involved in this Saturday's Irish Cup tie against Dergview, subject to international clearance, and feels there is so much still to play for this season. "There's a lot to play for and you can see in the league if you go on a run you can rise up the table," he said. "It's just about getting momentum and getting a few wins, that comes from hard work on the training ground. "I've been trying to keep myself fit for a while now but nothing beats games so hopefully I can get some minutes on Saturday.